Faraway Press: The Online Home of John Jackson Miller: Overdraft now available worldwide -- and download the prequel for free! 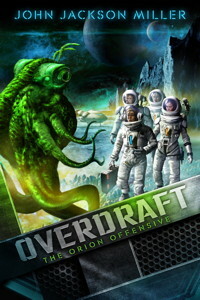 Overdraft now available worldwide -- and download the prequel for free! All sorts of news today! "Poison Pill," the last chapter of Overdraft: The Orion Offensive, has now released -- featuring Bridget Yang and her team in a pitched battle to rescue their trader, Jamie. And unbeknownst to them, the stakes are the very survival of the Earth! The release means that the book has completed its run in the Serial program, and thus available for purchase worldwide, both as a physical book and an e-book. The UK order link is here. 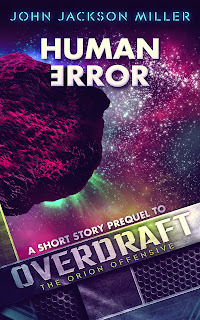 And to celebrate the release of the completed Overdraft, I'm releasing the original prequel short story to Overdraft, "Human Error," as a free download just this week on Amazon! Through Sunday, July 12, you'll be able to download the first Bridget Yang story, set just days before the events of The Orion Offensive. Bridget Yang's armored warriors were equal to any interstellar danger -- except bureaucracy! Bridget and company discover at the worst possible moment that their multi-world federation has sent them the wrong species' armor. What do you do when an alien menace is devouring the world beneath you — and you've got nothing to wear? As part of the Kindle Select program, "Human Error" will be free this week and 99 cents afterward. Grab it now to get the complete story — and then drop back here to read the production notes on the story, back from when it originally appeared in the Armored anthology. And while we're talking about the Serials program, Amazon announced just yesterday morning some pretty big news: the launch of Jet City Comics, its own graphic novel imprint. Comics will be released as serials, just as in the Overdraft example — graduating to graphic novels at the end. Click to read more about it! More news still? Okay. 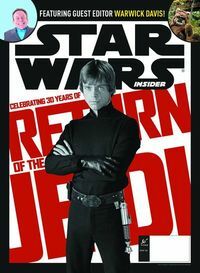 The folks at Del Rey have announced the title for my short story in Star Wars: Insider #143: "Incognito". They've also released a peek at some of Chris Scalf's art for it. As you may have heard, "Incognito" is a prequel to Star Wars: Kenobi — but it actually takes place during the events of Return of the Sith, when you think about it, as Ben hasn't reached his final destination yet. It's a fun story and features a new character whose origins go waaaaay back in my Star Wars work; that should provoke quite the search! And Troy Denning's Star Wars: Crucible released yesterday, and that includes as a bonus the prologue for Star Wars: Kenobi. (I guess it's bonus prologue day!) And just one day left on the Kenobi drawing at Goodreads. Whew! That's it. I'll be doing some more work on the Overdraft production notes page and timeline, as preparation for San Diego Comic-Con allows. Overdraft reaches Earth -- plus, an e-signing!